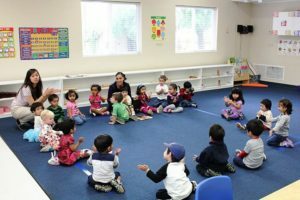 If you are searching for the best preschools in Alamo, California, you need to widen your horizons a little because the best Alamo preschool is in Danville. It is Learn And Play Montessori and we are just off the 680 in San Ramon Valley Drive, so although it is not in Alamo itself we are only a few minutes away and very convenient for people who have to commute. Our campus in Danville is in a Tudor cottage style building and has wide, airy classrooms in which the children can explore the wide range of Montessori materials which we provide. There are eight classrooms in total and at the back of the school is a huge playground in which the children can develop their gross motor skills while at the same time exploring nature. The playground is gated and perfectly safe. In the Montessori method of learning, each child is given the opportunity to explore all the materials and choose the things that he wants to learn about. Thus he learns because he wants to learn rather than sitting listening to a teacher talking. The Montessori method helps the child develop creativity, problem solving, critical thinking, and time management skills, along with care of the environment and of his fellow children. The teacher observes what the child is doing and introduces him to further materials at the time that is appropriate for the child. Because they are enjoying what they are doing, the children learn to love learning, and they develop concentration, persistence, discipline, and motivation. Every child works at his own pace, so no child is forced to perform to a standard, and at the same time a child who is a quick learner is not held back. Equally, there is no sense of competition, each child competing with himself. The children also learn by helping each other, with older children often showing the younger ones the way, which at the same time underscores their own learning. If you are looking for the best preschools in Alamo, California, then you should definitely come and take a look at Learn And Play Montessori in Danville. We also have children who live in San Ramon, Blackhawk, Diablo, and as far away as Walnut Creek, whose parents have been recommended by their friends or family. We open early in the morning, so you can drop your child off on the way to work and pick him or her up again on the way home. Our program is available year-round for toddlers, preschool, preK, Kindergarten, and after school for children from the ages of 18 months to 6 years old, so if you want the best preschools in Alamo, California, you know where to come.